Exercise your furry friend's body and their brain! 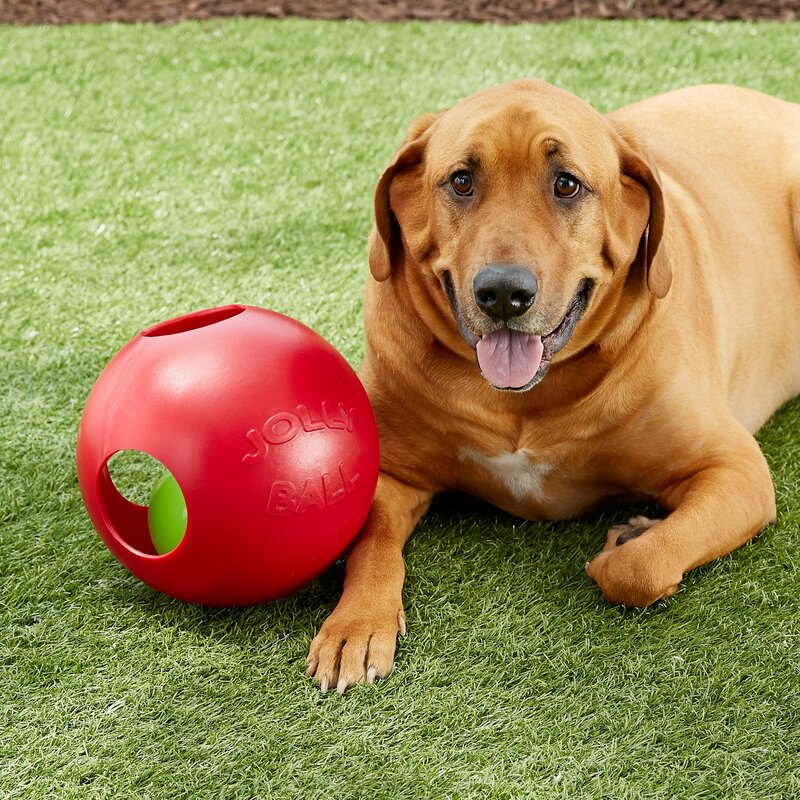 The Jolly Pets Teaser Ball Dog Red Dog Toy is a fetchable puzzle that can't be solved. After your loyal pal chases down the ball, she'll entertain herself all afternoon trying to remove the inner ball from the extra-durable outer ball, but no such luck! 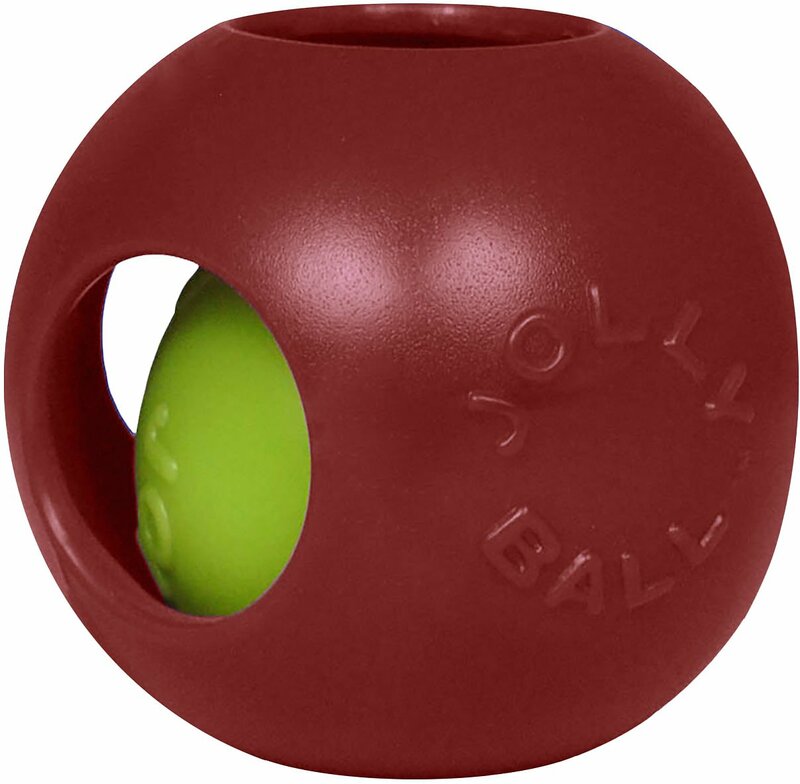 The Teaser Ball is just as fun to fetch as it is to try to figure out, making it perfect for solo play or bonding time. 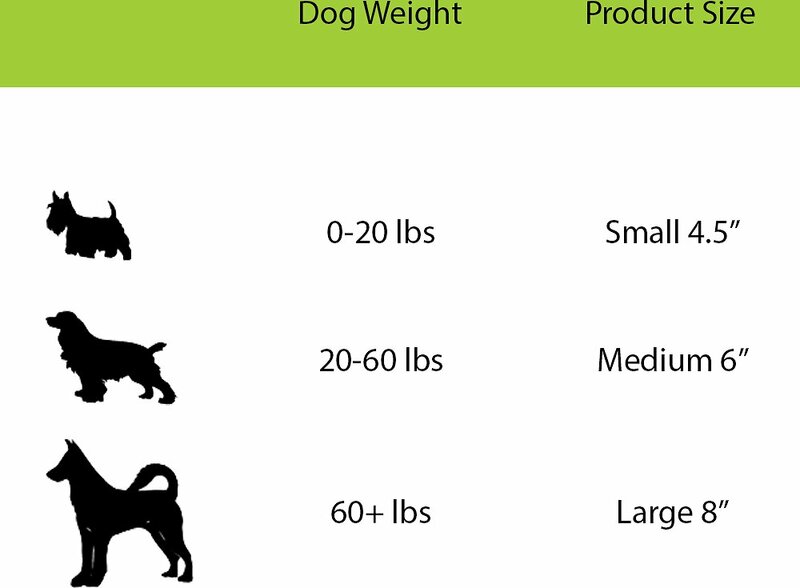 Made of high-density polyethylene for added durability, it's perfect for those heavy chewers. 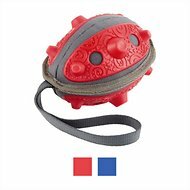 The ball-within-a-ball design means it rolls around erratically, creating hours of fun for your pup. For an added treat, spread some peanut butter or yogurt on the inside and watch your pup go to town. It floats so you can toss it in the pool, lake, or ocean and watch you furry friend have the time of their life. We got the 4.5" teaser ball for our 18-pound Havanese mix. It's the first hard plastic ball we've given Smokey and he loves it! He likes to put his paws in the holes and poke the ball, put his mouth in the holes and jump on the couch with it (the truest sign of devotion), push it around, and just lay down and maul it. He's owned it for an hour and, after retrieving it from the big dog (who also loved it), has spent most of that time playing with it. I definitely recommend this toy and would buy it for him again. I'll be buying a bigger size so the big dog can have her own! 4.5" (ball within a ball) teaser. My 20#, 9 month old Boston Terrier loves balls. I wish I found this particular ball/toy months ago! She carries it around in her mouth, chases it, bites at it, and tries to get the impossible inner ball out. No more boredom!? Our dog is a power chewer! !He loves the Jollyball!! !Hasn't been able to make even a dent in it!! Funny watching him chase it around, the little ball inside makes it fun! My Cane Corso loves this one but it stresses him a bit because he can't get the ball out and he's not used to not being able to destroy a toy. I give it to him under supervision for interactive play. Durable and entertaining. Purchased this ball b/c we have purchased several of the horse sized Jolly Balls with handles for the dogs. Thought I would give this a try. Destroyed in less than 20 min. We have gone through 2 of these balls in the past 7 years and he is currently working on his 3rd! My dog is very rough on toys, yet he has somehow managed to keep them for a while! We finally had to throw the last one away because he got to the center ball. I would highly recommend for aggressive chewers! My GSD loves this toy and also his Jolly Egg. He is almost always carrying around and playing with one or the other. This is a very sturdy toy and this is the second one we have had. The first lasted years and even got run over by the big lawn mower and survived with a few dings. This one is a few months old now and still looks great. High quality and definitely recommend it. Worth the money to have toys that last! These balls are nearly indestructible and very entertaining! I have given 4 to the rescue that I volunteer at and the dogs love them! My dog goes crazy for this ball, however I have to monitor him with it. He chews on the hard plastic outer shell and I’ve found splinters and he has created a hard pointy tear in outer shell. I was warned by friends to just get the smaller size as the larger balls have holes where if dog bats ball around, they can stick a paw into the holes. Didn’t realize he would want to chew on the smaller one. All that said, he absolutely loves this ball and we will still play with it, but supervised.